1. The average first time mom doesn’t go into labor till she’s 41 weeks and 2 days. That’s nine days past her due date. I know, none of us like those numbers…but it helps with perspective. 2. When you think you’re in labor, make sure you’ve noticed a pattern of contractions for AT LEAST an hour before making a bold proclamation on Facebook or Twitter that you’re in labor. Remember to look for 5-1-1. Contractions that are at least five minutes apart. Contractions that are at least one minute long, and contractions that have been coming that frequently and at that length for at least one hour. (The contractions should gradually be increasing in intensity). That’s a good gage as to when a first time mom “might” consider going to the hospital or birth center. 3. The average woman’s first time labor will last between 18 and 24 hours. Some women labor longer, and some women labor shorter, hence “average.” However, this is truly an accurate picture of how long you can expect your labor to last. The good news is this: the hardest part of labor, transition, usually only lasts a couple of hours, at the worst. One man documented his wifes contractions for the entire labor, from the onset of her labor till the end, she had 45 minutes worth of pain for her 24 hours of labor. 4. Ignore it till you can’t ignore it anymore. If you’re not sure you’re in labor, then you’re probably not in active labor yet. 5. Early labor often feels like menstrual cramps, and can last that way for days. 6. Losing your mucus plug really doesn’t give clear indications that labor is close. Don’t call your OB, midwife, or doula at 3AM letting them know you’ve lost your mucus plug, because they may tell you to go find it. However it doesn’t hurt to mention it at your next visit. 7. If your water breaks, or if you continually feel like you’re peeing on yourself, without question, call your care-provider immediately. Also go put on some Depends. You’ll thank me for it, and it’ll be nice not to leave a trail following you. Remember the acronym COAT when your water breaks. Pay attention to Color, Odor, Amount and Time. The color should be clear, the odor should not be stinky, the amount can vary – did you have a lot or a little, does it come out with each contraction? And last but not least, make note of the time your water breaks, (most OBs want you to deliver your baby within 24 hours of your water breaking) these are all important things your care-provider may want to know. Also if you are GBS positive remind your care provider of this when you mention your water has broken. 8. Eat at home while you still have the desire to do so. Once you’re at the hospital eating is not typically an option, clear liquids are okay (unless you’re having an epidural, then it’s ice chips ONLY). My favorite drink is this fantastic labor-aide found here. 9. Drink, drink, drink. Pee, pee, pee. An empty bladder helps relieve some of the pain of the contraction and staying hydrated is VITAL for your body and your baby. 10. If you can still talk through or laugh in between your contractions, you’re still in early labor – unless you’re a hoss. 11. Once you’re bellowing like a moose or breathing heavy like you’re working out, and your partner looks concerned, you’re likely in active labor. 12. Stay moving! Sway back and forth leaning forward, get on all fours, sit on the birthing ball, just stay moving. Try to avoid being in bed till absolutely necessary. 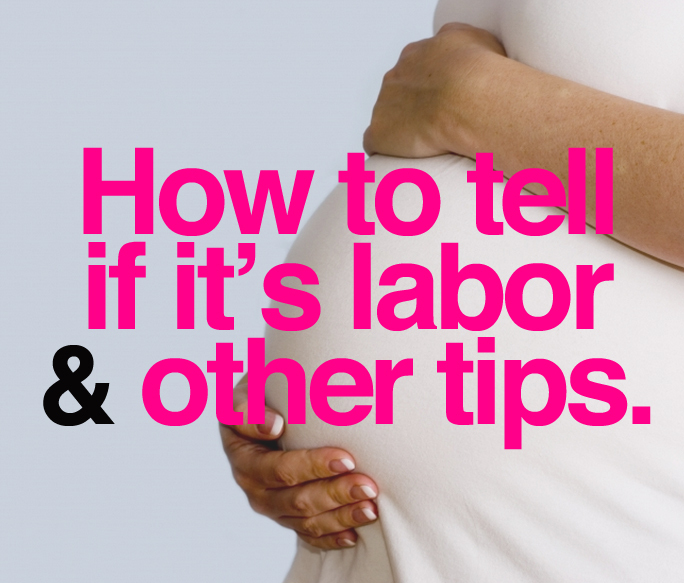 For some fantastic practical tips on moving through labor visit this link here. 13. Through and after your contractions, make sure you think about breathing all the way down to your baby. One of the first things L&D nurses will do if your baby shows heart decelerations is give you oxygen. So, when you breathe through your contraction think about/visualize breathing all the way down and to/for your baby. You’re not the only person experiencing labor, your sweet baby is too and he or she needs you to breathe for him/her. 14. If you’re getting an epidural, try to wait till you’re at least four centimeters. 15. Remember there is more to progression of labor than just how dilated you are. The position of your cervix, how soft it is, how effaced it is, and the station of the baby all make a difference in your labor. In my experience, I have found that once a woman is completely effaced, she’ll plow through labor like a mack truck with a driver on speed. 16. You cannot escape the pain of labor, meaning, if you’re attempting an unmedicated birth, freaking out over the pain of the contraction will only worsen it. Try to imagine contractions like waves washing over you as you surrender to each rush. Visualize your cervix opening wide for your baby. I can always tell if a woman is trying to escape the contraction if she yells, or says, “No, no, no, no!” through it, or shakes her head and scrunches up her face and tenses her body and does what I call crazy legs, where she moves them like a toddler throwing a fit on the floor – back and forth through the contraction. These are signs that you’re letting fear of pain take over your body rather than trusting that your body is doing exactly what it should be and that you are created to do this – labor and give birth to your child. Trust the process, if you do, others will too. 17. Avoid getting in the tub too early in your labor. Otherwise it may slow down your labor. However, if it’s the middle of the night, and you’re uncomfortable with cramping that keeps you up, feel free to get in the tub. It may ease off your contractions just enough so you can get some sleep. 18. Feel free to use a shower at any point in your labor…this doesn’t seem to stall out labor. 19. If you’re birthing at a birth center or your home, don’t worry so much about writing a birth plan. However if you’re birthing at a hospital and you want an excellent sample go here. I encourage all parents to pay apt attention to your desires for newborn procedures. What are those you ask? Ah…look here, and here. 20. The hardest part of labor are the two weeks following it. Make sure you spend time understanding breastfeeding and life with a newborn before you give birth. 21. You may poop while you’re pushing. Most women do. It’s not a big deal. Personally, I think it’s a sign that you’re pushing effectively if you do poo. Just think of it more like Hershey’s Kisses, rather than Tootsie Rolls. Bearing down for pushing is the exact same thing you do when you bear down for a BM. There’s just no easy way around it. Every woman’s labor and birth is unique and may not always fit into the tips listed above – especially if there is potential for a precipitous labor (more likely with mothers who have already experienced childbirth). The tips on this blog post are provided for general informational purposes only and are not intended as, nor should these tips be considered, a substitute for professional medical advice. I would add onto #2 that 5-1-1 rule applies to different positions as well. If they are consistent through walking around, all fours, lying down, etc…I had a situation where the 5-1-1 was accurate for the couple, except they were staying in the same type of positions (all fours, leaning over the bed while on the birth ball). But when she finally was in a bed (in the hospital), they spaced out to 10 minutes. So I emphasize to my clients to try switching positions more frequently and see if anything changes. Good point, Michelle! I’ve also noticed that when baby is mal-positioned the contractions seem to reflect that as well…spotty and slow or not specific pattern to follow. When I was in labor with #2, I started labor at around 1 in the morning, but my contractions NEVER became regular, especially not for an hour. When I finally called my Dr. and went in, I was already 7 cm and around a 0. Had to rush for a section. You don’t always have regular contractions. Oh, and it wasn’t just the being in the hospital that spaced them out…she labored all weekend where the contractions where 5-1-1 when upright and then 10 min apart when lying down. Just popped in to read this again in hopes I notice some positive signs in about 7ish weeks…sigh. I love the perspective of #3 – 45 minutes of pain (actual contractions) from the entire birth. When reflecting on my births I found that there truly was only one HARD hour in each (transition/pushing) and even that had breaks between contractions. I have seen (once) a mom smiling and laughing between contractions in transition (I have pictures!) and she really had us surprised when she stood up a second later and was pushing, baby was out less than 15 minutes later. And #10, what is a hoss?? Oh Heidi! How funny! A hoss is essentially someone who is really strong. I don’t agree with some of it… I ignored my labor because it wasn’t strong contractions and wasn’t painful. I FINALLY went to the hospital only to find out I was 10 CM. I was talking and laughing through every single on of my contractions. Heck I drove myself to the hospital. You, Danielle… are a hoss =) and believe me, that’s a good thing. The tub for me was the accelerator! I was not dilated (according to the nurse), my water had broken 15 hrs prior and he put me in the tub to get baby’s heartbeat 1 1/2 hour later I was holding my baby. The shower on the other hand caused my contractions to space out. I strongly urge you to remove the third link in item #19, regarding birth plans, specifically because the template you link to declines newborn screening. My sweet daughter would be DEAD without that simple test. It saves lives. PERIOD. My husband and are both healthy and come from families with no history of sudden infant death. Yet my daughter has a rare genetic disease that newborn screening detects. It is foolish and pointless to decline newborn screening. Please make the change. I fully support and strongly recommend newborn screenings, without question they save lives. Thanks for your heads up on the link issue. I reread the link and can see why you brought this up. I know this particular blog writer strongly recommends newborn screenings as well, having read many of her blog posts. I think that’s why she put in brackets her comment about what she feels about it. I felt that she used newborn screening an example of what someone may decline against medical advise and how they would need to mention that in their birth plan, though I think it’s a bad example of something anyone would consider declining. I’ll write her to see if she could find another example. This is a dangerous article. I get that it’s trying to reassure new moms to be that their labor isn’t so “bad”, but to say that a midwife, dr, nurse, or other person might make fun of a worried parent is deplorable. Many, MANY people go into early labor with first babies. And it is not abnormal to have a new mom miss labor symptoms until it’s too late. Following this columns advice would have killed my daughter at 33 weeks, my nephew at 30 weeks, and my niece at 35 weeks. None of the pregnancies were “high risk” and all mothers were getting exceptional care. I urge you to pull this article. I do not completely agree with number 16. Yes I agree that freaking out does not help ths pain. But I had a natural birth and my way of coping with the contractions was to move my leg back and forth! It distracted me from the pain. a few of the issues one should consider when contemplating dress. in India inspired the Run or Dye event. I was dilated to a 6 and did not even realize I was in labor, the only reason I went in was because I was scheduled for an induction so I wouldn’t wait until you are in excruciating pain to go in ESPECIALLY if you don’t live close to hospital… And there is no reason to wait until you’re a 4 for the epidural, the sooner the better if you are going that route… With my first I had mine when I was only 2 cm dilated, it was GREAT, didn’t have to worry about getting up and dragging all the cords with me to bathroom and I progressed just fine and never felt any pain. Having an epidural early has a high risk for complications such as stalled labor, fever and can lead (evidence based research) to C-sections. Not saying not to get one but you need to be in an active labor pattern with cervical changes. Seen a lot of C-sections from early epidurals as an L&D nurse. Having said that. I strongly recommend future parents to do extensive research for side effects of epidurals. media are incomes excessive earnings from sports activities reporting. Don’t worry though, with some practice and the right guidance you can improve your skills. you’re right. I wrote this almost nearly five years ago now, and I’ve been so busy with nursing school and family and life that I haven’t updated it, but yes, you’re right it does take a different direction in the middle of it.